A debut autobiographical manual targets the no-longer-young set. Deal’s work blends personal memories and life lessons, told by a man who has seen his share of happiness and heartache. He narrates coming out as gay to his parents over the dinner table and their disastrous reactions (it severely broke their relations at the time). In a rhetorical move that will be repeated many times over during the course of the volume, he instantly turns the story of that all-too-common tragedy into a fulcrum for a quick lesson about self-reliance and the drive to turn bad situations around. Deal attended Florida Atlantic University, got his master’s degree from Nova Southeastern University, and transformed a stocking job into a 20-year career in the Ralph Lauren Corporation. He traces his own trajectory through school years, vacations, family crises, a cheating partner, his abusive father (who was eventually sentenced to time in federal prison for his involvement in a drug cartel), and a dozen tales about college friends and work colleagues. He always fills them with amusing or touching personal notes—and inevitably comes back to anchor new lessons. Some of these offerings are so simple as to be self-evident (“If you need to say something, say it”; “Remember your college years fondly”). Others are distractingly flippant, as when Deal caps a chapter about keeping physically fit with “if body image is something that you are struggling with, work even harder because I feel more fabulous than ever,” adding, “Woo-hoo!” (A few of the guide’s axioms can be unintentionally funny, as when he warns his readers: “Some friends can be toxic to you in every sense of the word.”) But the book adds to its winning approachability with plenty of photographs of the author and his friends and family, and the ultimate effect is of sitting across a table from Deal, listening to his favorite yarns. 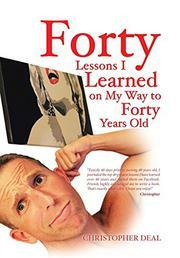 An intimate, inviting, and accessible inventory of lessons one man learned on the road to 40.